NECKLACE - SARAH COVENTRY. "FIRST LADY" FROM 1951. 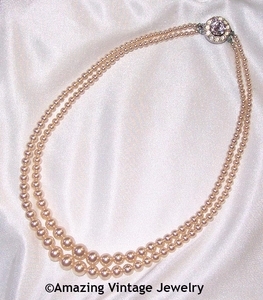 DOUBLE STRAND OF FAUX PEARLS WITH BEAUTIFUL CLEAR RHINESTONE CLASP. THIS NECKLACE WAS ORIGINALLY INTRODUCED IN 1951 AND WAS SO POPULAR THAT IT CONTINUED IN STOCK FORM OVER 10 YEARS. THERE IS A LITTLE VERDI GRIS AROUND THE CLASP ON THE CONNECTORS - OTHERWISE VERY GOOD CONDITION. RHINESTONES ARE BRIGHT AND CLEAR - PHOTO SHOWS REFLECTIONS ONLY - NO CLOUDINESS.